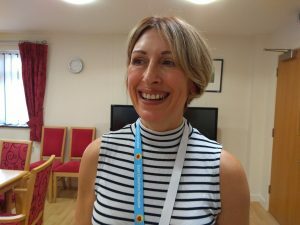 Our Hospice Director Karyn Johnston has a substantial history of volunteering, so we thought it would be good to hear how it informs her role as ECH director. For as long as I can remember I’ve been a joiner-inner, I would often hear my mum saying, ‘That’s our Karyn, she’s in everything but the crib’ so I’ve been volunteering since I was seven years old. My first role was as a water carrier for my Dad’s football team, at school I was an older person’s shopper, then I helped in summer schools for under privileged kids when I was a teenager. At university and into my late-twenties I was a Samaritan, on moving to Macclesfield I became a Magistrate and now I help out at Hospice events, am a trustee of the Roman Catholic Diocese of Shrewsbury and an active member of St Alban’s, Parish Council. A wide variety of roles and I have loved every single one of them. I can fit my volunteering in around my full time work commitments, get to team up with wonderful people, have fun and use my skills and feel that lovely warm glow of knowing that I have made a real difference in my community. 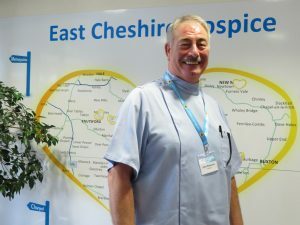 Volunteers are the backbone of East Cheshire Hospice – we literally could not function without their generous and unconditional support. East Cheshire Hospice is the sum of its volunteers and as a result we are all be proud to be part of it. Volunteering has a positive impact on a person’s wellbeing, I’d advise anyone to get involved and be well in mind and body. Obviously I want everyone to choose to volunteer for the Hospice as we need over 750 people to deliver the exceptional brand of compassionate care we give to our patients and families every day of the year. With over 20 distinctive volunteer roles, there is something to fit your skills, experience and availability – it’s so rewarding. 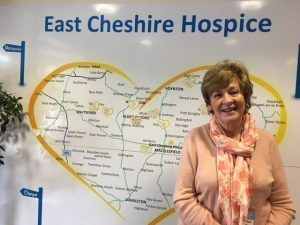 I know from my days in advertising that the best form of it is recommendation, so I’m recommending volunteering for East Cheshire Hospice to you. You will be well looked after and have all the training and support you need to do a great job. If I may, I will paraphrase JFK ‘ask not what ECH can do for you, but what you can do for ECH’. Try volunteering for us, and I guarantee you will love it! Elspeth has been a counsellor since the Hospice opened and she tells us about her thirty years volunteering, in her own words. “In 1988 when the East CFheshire Hospice first opened, a Bereavement group of volunteers was set up by a social worker at the time. 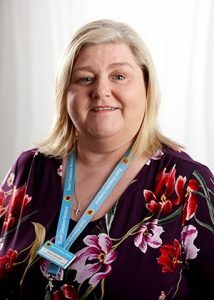 I was myself a practising social worker in Manchester and although I changed career and became a teacher, I missed the relationships you can only have in a caring profession, so I joined the Samaritans and then joined the newly established bereavement group. Over the first few years, I qualified as a counsellor whilst also teaching part time in a primary school. When I retired from teaching, I continued the counselling. I enjoy it because it gives me a purpose and I like being involved with a community. Recently, I’ve started working from September to May as my husband and I tend to go away quite a bit in the summer months. I have two clients at a time. I will see them once and if they want to come back again we usually arrange five sessions, after which we review how things are going. This allows me together with my client, to work out what they need. I generally counsel the friends and relatives and occasionally patients themselves. Every person is different, and every situation is different. I feel very privileged to sit with people who are often at their lowest ebb and to provide a safe space for them to talk. My role is to help people to find their own way to cope with their loss. The Counselling service in the hospice has not changed that much over the last thirty years: it’s more regulated now and training is more important than ever. There’s always been a dedicated counselling room and the one we have now is in a lovely quiet location. There’s a growing group of volunteer counsellors and there are regular opportunities for us to meet. We’re free to work using our preferred methods; there are many different approaches. I tend to use an integrative method. The Hospice abides by BACP guidelines and pays for counsellors’ supervision. Rose from Poynton describes her two hours a week with her male dementia patient as rewarding and humbling. She joined the army of more than 600 volunteers, who keep the hospice going, a year ago. Rose said: “I don’t work, my kids have grown up and I’ve got free time. I used to work in a caring profession and wanted to do something again. I don’t like to view someone as a dementia patient. That individual has a personality and it’s about getting to know the person and developing an understanding of dementia and how it affects them. It’s all very informal and isn’t a question of physical caring but being a companion. The gentleman’s wife is his carer and when I’m looking after him, she has two hours peace of mind to spend on herself. I visit their home and meet my client, we then go for walks or visit places of interest which always end with tea and cake, or an ice cream. If it’s raining we might do painting, colouring or looking through photographs and picture books. After a long career with the police and in business, John retired and moved to Macclesfield. He openly admits that he needed something to fill his days. Thus, he decided to come to the Hospice to offer his services. John volunteers regularly on the ward, fluctuating between the morning, lunch and afternoon shifts. During his shifts he helps with mealtimes feeding patients; making beds; with making sure facilities are ordered and available for staff and offering patients a listening ear. He laughs and explains that there are three trollies going up in size and importance. He regularly pushes the water trolley around filling up water jugs. Sometimes he is promoted to the rattling larger tea trolley and even, occasionally, the bigger food trolley, when he helps to clear up after mealtimes. He says “I do like to give, give of myself, talking to people, making people happier. I’m a bit of a jester.” Then, he adds more seriously, that his role as a ward volunteer is to take the weight off the nursing staff. John also admits, that at times, it does affect him, when he has built a relationship with a patient who then dies. A father of two, grandfather to five and soon-to-be-great grandfather, John also volunteers on every third friday of the month, in our Daycare Centre. Amongst other tasks, including preparing lunch and entertaining the patients, as a keen painter, he particularly loves helping with the art sessions. When asked why he continues to volunteer with us, John, without hesitation, says: “The people, nurses, everybody is fantastic; they all have a wonderful outlook on life”. 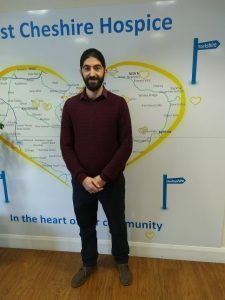 From a rural village in Cyprus, working in the fields, and then as a plumber and electrician, to living in Congleton and volunteering as a counsellor at ECH, Stefanos shares the life experiences that brought him to the hospice. Stefanos was brought up in a small rural village of approximately eight hundred people in his home country of Cyprus. The culture was a strict patriarchal one where children had to follow what their fathers wanted them to. This led to him qualifying as a plumber and electrician. Whilst working for a construction company, he realised he wanted to do something related to psychology and philosophy as he was always questioning life in an existential manner. Questioning life and experiencing new things helped him to complete a degree in Psychology. He then started volunteering as a counsellor for a substance abuse charity and in search of further development,decided to move where there are more health care opportunities: to England. In London he supported people with learning disabilities,down syndrome, and autism. It was this role that taught him more closely the power of unconditional love. Stefanos says: “this was one of the main experiences that changed how I related to people, I was more able to give without expectations. Existing within an unconditional attitude was very rewarding as I was often receiving positive feedback and positive expressions of thankfulness from the individuals I was supporting”. After this, Stefanos was accepted to do a master’s degree in experiential person-centred counselling and psychotherapy, at the University of Nottingham. Whilst doing his degree, he worked as a support worker for people with learning difficulties and dementia, and at the same time volunteered for an organisation in Chesterfield as a domestic abuse counsellor for survivors of domestic violence and sexual abuse. Through these new roles, he experienced further the significance and positive impact that authenticity, unconditional positive regard, and empathic understanding has on people’s lives. Stefanos now lives with his wife in Congleton. Amongst other volunteering, he is a volunteer bereavement counsellor at ECH. Stefanos states:“The people at ECH have a warm, kind and generous attitude and there’s a great team spirit. The premises are new and the counselling room is in a quiet location”. He relaxes and takes time out with his wife, by walking and being one with nature; he also loves reading and watching movies and documentaries. Please complete the online application form and we will be in touch. Thank you very much again for your interest and support.